Discover the Value of Artificial Intelligence – Machine Learning, in a Workshop. At Trifork we like to help organisations with Business Challenges. One of the current challenges companies face is how to find the potential value of Artificial Intelligence and Machine Learning for their specific organisation. Is there potential value in AI and how do we recognise this? How do we start with the identification of this potential? We have created an easy, practical way for organisations to start. We call this Accelerate for Artificial Intelligence or A4AI. It is the first stepping stone which provides you with insights about how Machine Learning can help your organisation excel. This start with Artificial Intelligence involves real users and business experts and the usage of cutting-edge AI Technologies. 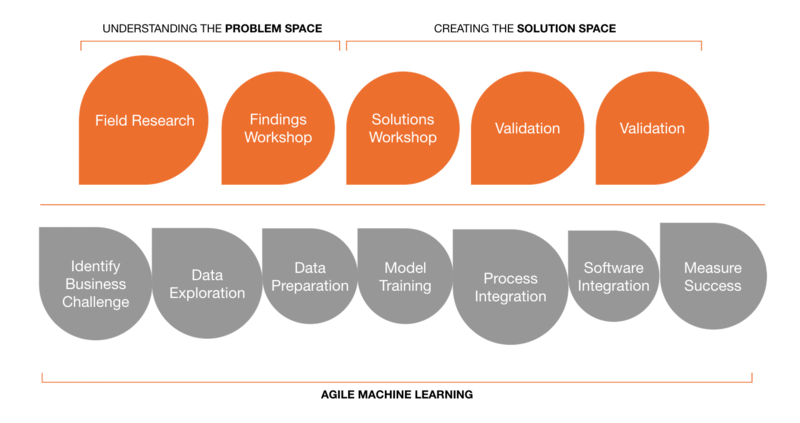 In a series of workshops taking between 4 to 6 weeks from start to finish, a model based on your data is developed together with a practical solution prototype. After evaluation, we show the business case for implementing this into your organisation. After the workshop, you will have a clear overview of all the solutions that your organisation can best use its data sources to excel. If you would like to learn more about this workshop, please download the brochure via the form below.